This crimson kitty, with a Cheshire-cat grin, striking color-blocked tail, and microfleece fabric, is super soft and squishy. Toby is the purrr-fect choice for a huggable, furry feline. 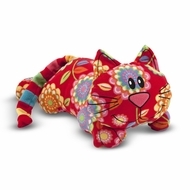 And like all Melissa and Doug Beeposh toys, this cat has style galore.